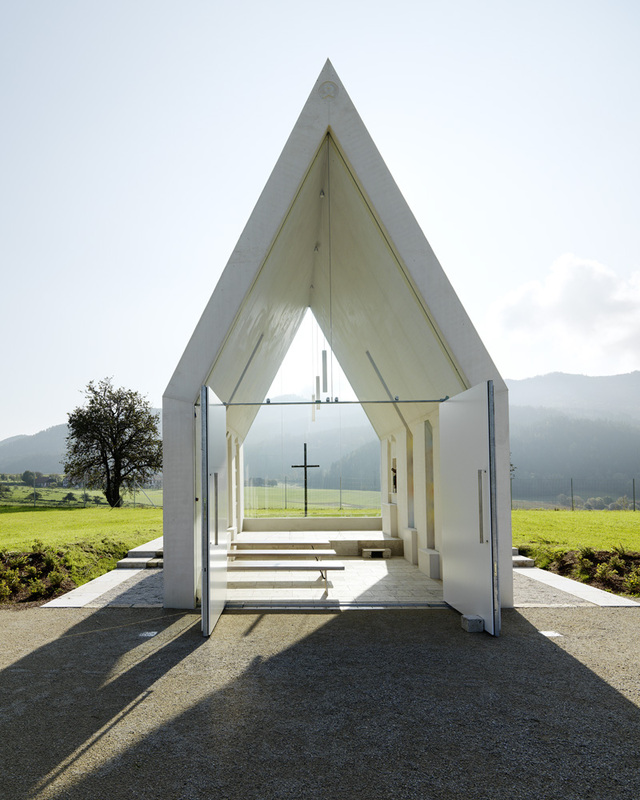 Sacher.Locicero.Architectes have designed the Maria Magdalena family chapel, located in Zollfeld, Austria. 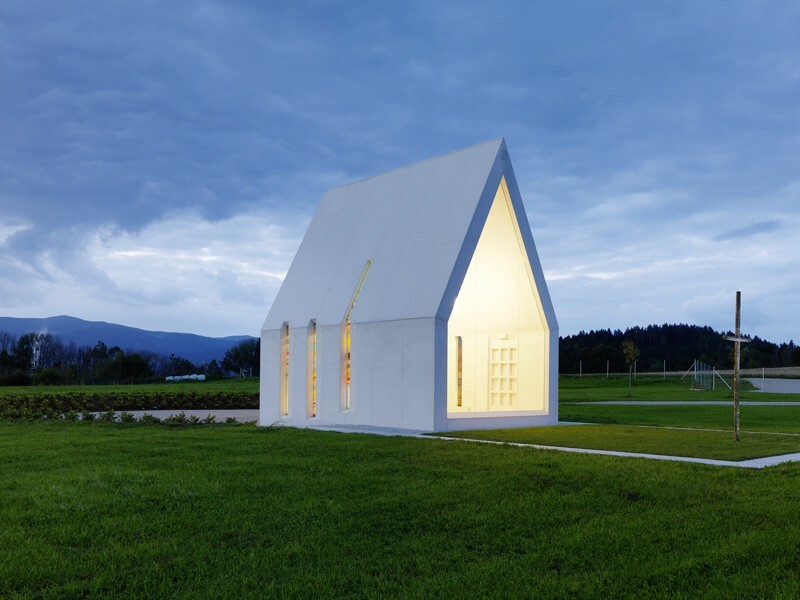 The family chapel Maria Magdalena by the architect Gerhard Sacher is a spectacular sculptural object made of white concrete ( SCC “self compacting concrete“). The constructers have proved a great portion of heart, trust and deep understanding for architecture in having created this project of an exceptional, timeless spaciousness, in which family ceremonies and festivities take place and where tranquillity, contemplation and remembering can be experienced in a unique setup. 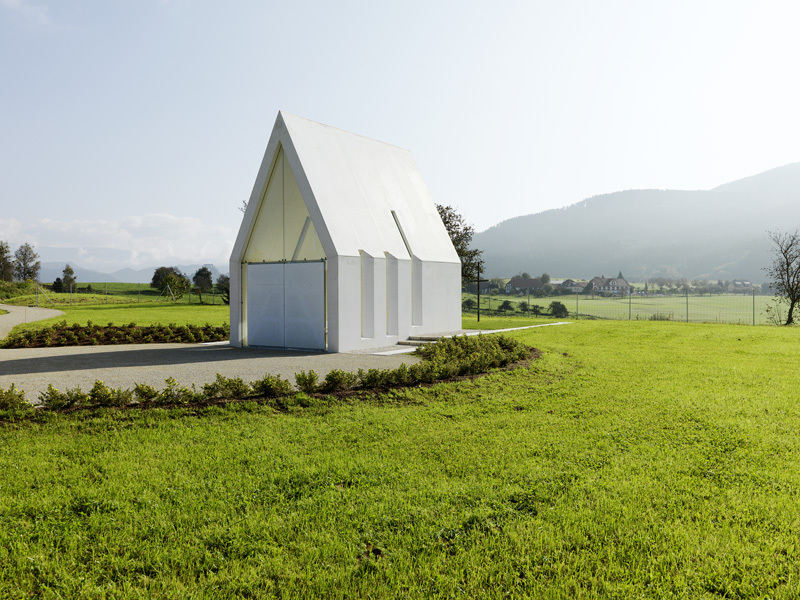 In a sighting distance to the Magdalensberg hill and the Hochosterwitz castle, the piece of architecture represents a modern landmark as an expressive symbol of an artless form language. The visitor approaches the spacious, round, slightly descending gravel forecourt via gently sloping access ramp. 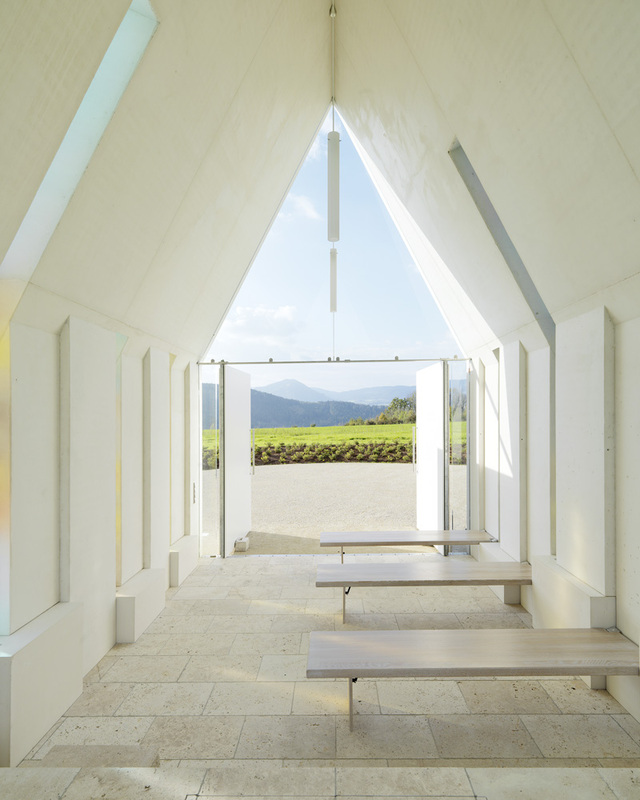 In the forecourt, there is the building from white concrete and glass incised in it, and the base elements interpret the form of a classical chapel in a contemporary way. 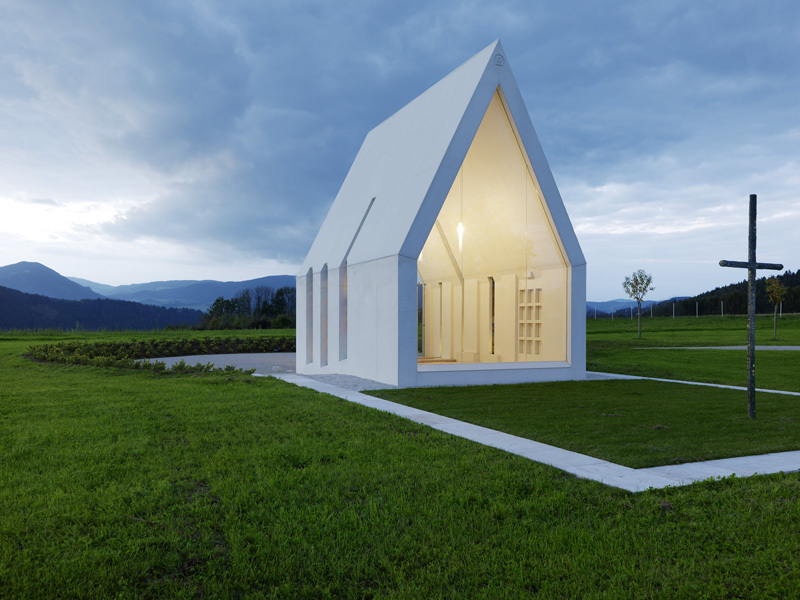 The immaculate, smoothly formed white concrete provides this piece of architecture with a special, artificial-like aesthetics and purity. Various light and weather conditions change the colour and surface impressions from a glowing, glossy white to a cold, matt white blue of the dawn, through which there are innumerable shadings and textures to be observed. The ridge of the gable roof is 7,78 meters high. In the side walls, there are transversely cut-it window slots, three on each side. 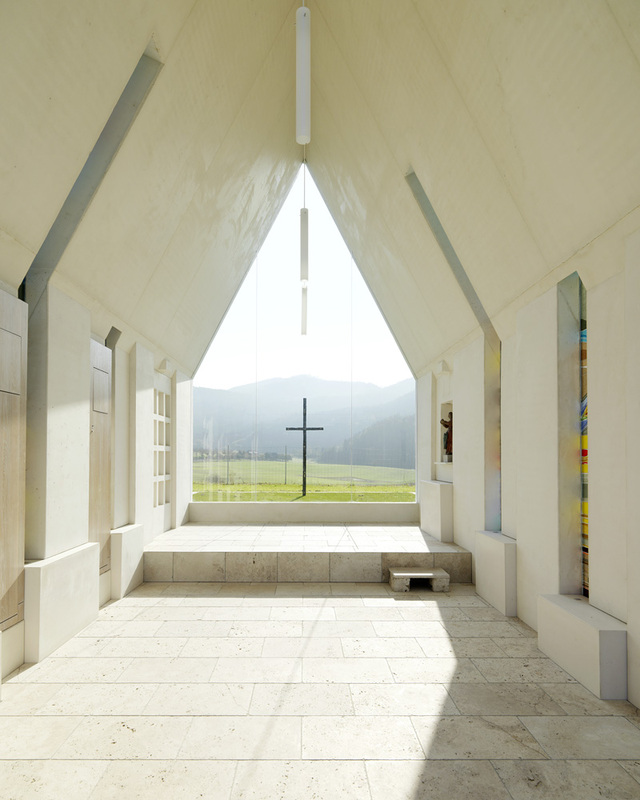 The transversal cuttings of the windows are positioned in line with the sun rays incidence, so that the morning and/or evening sunshine hits the coloured vitrification made by prof. Karl-Heinz Simonitsch, a Carinthian artist. The windows are made of multi-colour glass layers and depict the six days of the genesis. 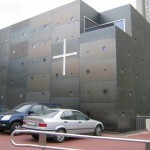 The east-side front with full-size glazing and the outside bronze cross by JaromirGargulak, a Czech artist, represents the last day of the genesis. 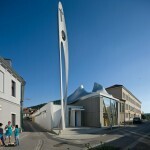 The opposite, towards the forecourt situated, massive, bronze, two-wing gate is handmade by the same Czech artist and can be wide opened integrating the forecourt, und thus offer room for those standing outside. 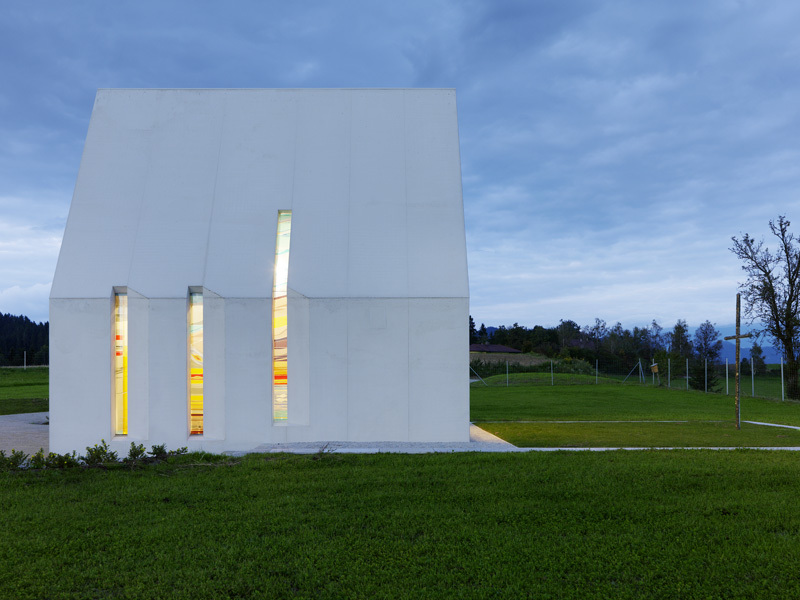 The massive, white side walls inside shield the abundance of the surrounding cultural landscape and creates a bright, contemplative space radiating peace and purity. 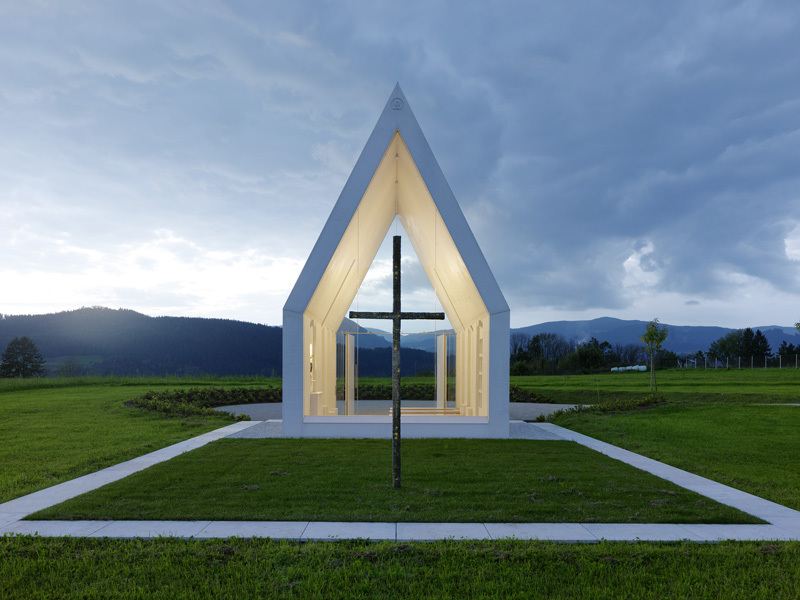 The fully glazed east-side offers the sight of the dark bronze cross against the Magdalensberg on the horizon building the spiritual connection to the outside. The interior is deliberately simple and variable at the same time. The formative element of the space is the floor made of cream and beige travertine tiles. 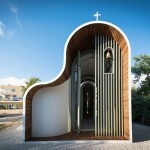 Just a single step in the rectangular layout of the chapel marks the transition from the chapel nave to its choir. The walls along the choir include rectangular niches – on the right, there is a larger slot with the statue of Maria Magdalena, the patron saint of the chapel, and on the left, there are 12 smaller urn slots. 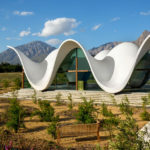 On the left, in between the coloured windows, there are insusceptible fold-out banks made of white washed oak that are flush mount in the concrete wall.